Leku-Ona Global Solutions S.L. has relied once again on AR Racking for the recent expansion during this 2018 of its warehouse in Deba, in the Alto de Itziar. 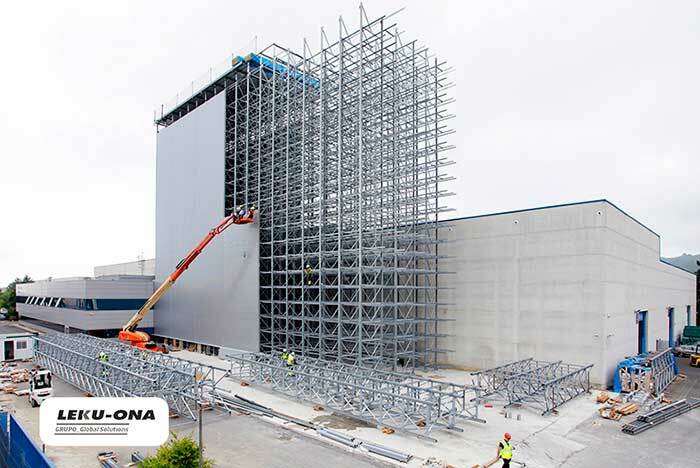 Already in 2015 AR Racking was the company chosen for the installation of the storage solution at Leku-Ona's new warehouse. In 2017, AR was also responsible for its second expansion with the installation of an automatic Miniload system with a capacity of more than 6,000 boxes. Leku-Ona Global Solutions is a company specialized in the manufacture of components related to automation in the fields of Pneumatics, Hydraulics, Machining, Laser Cutting, Tube Forming and Assembly. It is a reference in the industry, and with over 45 years of experience, Leku-Ona Global Solutions continues to focus on diversification, global solutions and the continuous improvement of productive projects. This success has led the company to carry out various expansions of its facilities. In the last extension -completed last summer- the installation of a Clad Rack system with a single-stage stacker crane was carried out. The main characteristic of the Clad Rack system is that the shelving is part of the structure of the building. In this system, the racking not only supports the load of the stored goods, but also the load of the building envelope, as well as external forces such as wind or snow. In this warehouse of 531m2, a storage area of 15,909m3 has been achieved due to an exceptional height of the 32-meter structure that is only possible in Clad Rack warehouses. The total capacity of the warehouse is 3,040 positions and in this last installation the loads are managed with a single-stage stacker crane, an automatic system that uses robotic equipment to handle loads. As it was the case with the solutions installed in 2015 and 2017, this system has been developed by AR Racking in close collaboration with the logistics engineering of Ulma Handling Systems, the company responsible for supplying the automated mechanisms for the storage structure designed and developed by AR Racking. For Alex Zabala, Leku-Ona’s Commercial Manager: “once again we have relied on a group of specialists who had already shown us, in the previous expansions, that with an improvement in logistics capacity, we can be more efficient and offer a better service to our clients". Josu Monllor, AR Racking’s Project Manager, assures that "in AR Racking we try to find the best storage solution for each client. In this case the Clad Rack warehouse has been the optimal solution for Leku Ona Global Solutions as it improves the use of space and the savings that it represents not having to carry out any civil works". Take a look to more photos of the installation here.